The Coronation Parade turned round at the end of Horsham Road (Covert Mead had not been built then) and retraced its steps back to the recreation ground. The Coronation Year Queen of Handcross, Pease Pottage, and Slaugham (Warninglid had its own celebrations) was 18-year-old Joan Weller of Cotsford Nurseries, Pease Pottage. She was chosen at a dance in the Parish Hall, as were her attendants Daphne Mitchell (15) and Mary Tomsett (16) both of Handcross, now living close to Bath, and in France, respectively. The other Queen in London was transported by the 4-ton Gold State Coach pulled by a team of eight horses. 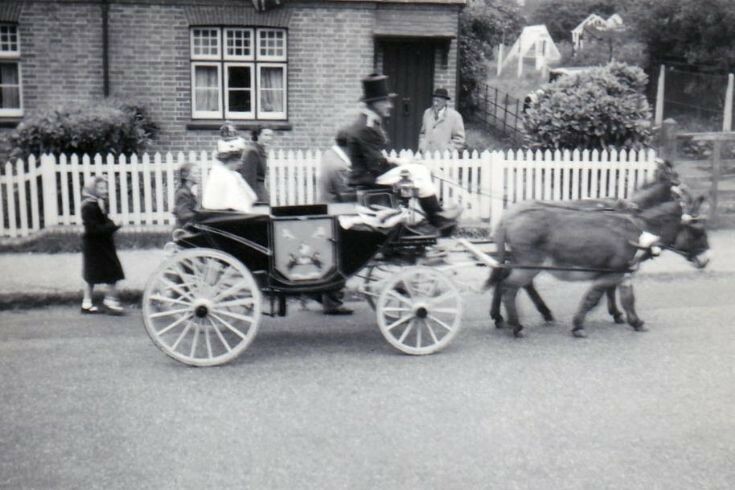 The Handcross coach was a more modest affair pulled by team of two donkeys who, nevertheless, coped admirably with the long haul up Horsham Road.